Cliffe FC are into the next round of County Cup with a 3-2 win at Malton & Norton Reserves. Cliffe FC Reserves suffered a 3-1 home defeat to Poppleton, and Cliffe FC Sundays gave a good account of themselves in a 5-3 home defeat to champions Wigginton Grasshoppers. Cliffe FC are into the next round of County Cup with a 3-2 win against Malton & Norton’s second team. Cliffe made the long trip to Norton college, and the home side looked shaking in the opening minutes and an error cost them for the first goal, Elliot Clark hitting a ball back into the box from a Norton clearance from about 35-40 yards, and Clark saw his ball bounce over the ‘keeper and into the net to put Cliffe ahead, 0-1 – Liam Tomlinson deserves credit as he closed the ‘keeper down the force the error. Cliffe worked well when on top and the welcome return of Kevin Taylor combined with Tom Grundy in midfield role eventually led to Grundy doubling Cliffe’s lead before the half-time break, the defence opening it self for Grundy to hit a low drive from the edge of the box into the bottom corner, 0-2 HT. Matt Birch came mightily close, after robbing the defender on edge of the Norton box, hit a shot that drew a good save from the home side’s ‘keeper and keep the score 0-2 at the break. Norton had the first chance of the second half, but Cliffe went further ahead, Grundy with his second and the goal of the day – the ball sitting up nicely inside Norton’s half for Grundy to hit a half-volley the went over the ‘keeper and into the top corner (see video below) – 0-3 and Cliffe looked like they’d be going through with a comfortable win. Maybe the Cliffe team on the pitch thought the same as Norton snatched a cheap goal for 1-3 giving themselves a chance, a nice corner and header saw Norton reduce the deficit to one and make it 2-3 – a real cup tie emerged and Cliffe had to see out the final 20 minutes as Norton threw everything at Cliffe. Clark and Joe Dack at the heart of the Cliffe defence superbly, Clark earning himself MOTM award. Connor Potts went on a mazy run that seemed to evade 4 or 5 challenges but was denied by a last ditch challenge. Norton came close to forcing extra-time but a goal line clearance from Dack saw out Cliffe’s win and put them in the hat for the next round, 2-3 FT.
Next week is a return to league fixtures, title favourites Thorpe United are the visitors to Oxen Lane as Cliffe FC’s first home fixture of the season. Yesterday, @tomgrundy1 makes it 3-0 with a beauty of a finish. The eventual winner, as #CliffeFC won 3-2 in the end. Another good performance from Cliffe FC Reserves’ young side, but sadly another defeat. Poppleton were the visitors to Oxen Lane this weekend, and they left with all three points on the day. Alex Oliver scored Cliffe’s goal, and it was a close run thing between Oliver and youngster Max Dutton for MOTM. They have a free week next weekend, and then return to action away to York RI Reserves. Cliffe FC Sunday push champions Wigginton all the way with a 3-5 defeat, Cliffe taking the lead, 1-1 at HT. And nearly getting the scoreline back to 4-4 in the dying minutes. Cliffe started very well and matched the champions, the home side had the lead when Tom Collins bundled in a goal at the near post to make it 1-0. Wiggington were then frustrated by Cliffe for the rest of the half but did get themselves level, pouncing on a rebound to finish from a really tight angle, 1-1 HT. Wigginton rallied in the second half and got themselves ahead 10 minutes into the second half, 1-2, and scored again on 65 minutes, 1-3. Cliffe their own undoing when in possession of the ball and giving it away cheaply. Wiggy got themselves into a 4-1 lead, but Cliffe gave themselves a chance – a freak own-goal from the team in green for 2-4, then a magic goal from Dan Richardson – a 38 yard shot from the right wing that lobbed the ‘keeper for 3-4. Cliffe may have looked to get themselves level as Cliffe opened up a number of chances in the final minutes, Wiggy caught Cliffe from the kick-off though and got their fifth goal to kill the game, 3-5. 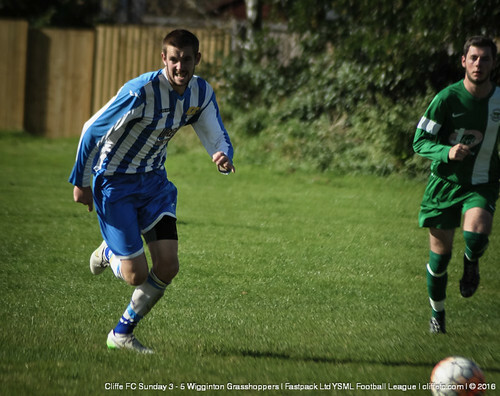 Wigginton got the win, but Cliffe showed a proper account of themselves to build upon as the league game now follow. Marcia Bishopthorpe away is the task next Sunday morning. MOTM: Tom Collins.